We invite all parishioners and guests to come together to pray for many needs and intentions, reflect on teachings that are shared, and offer quiet reflection for the enrichment of both Saint Charles Borromeo and Saint Anne Parishes, our own personal journeys, and society as a whole. 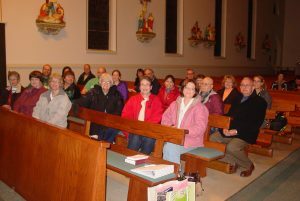 The St. Charles Prayer Group meets the first and third Tuesday of the month from 7:00-8:00 pm in the Church. It is in the spirit of unity that we hope to enrich our parish community through prayer and reflection, focusing on the needs of our parishioners and our own spiritual growth. All are welcome! If you have any special intentions you would like to have us pray for please place them in the offertory basket, send it via email to st.charles.prayer.group@gmail.com, or bring it to the gathering and we will include it in our prayers. Please remember to include our Changing Lives Together and Building Project and all of our Parish family in your prayers. Each day From Ash Wednesday through Easter Sunday, Fr. Robert Barron will send you a short email with an uplifting spiritual reflection. The reflections are available in both English and Spanish. Sign up here: Lenten Reflections. At the July Prayer Group gathering we prayed the Patriotic Rosary for our country. We invite you to print and say this rosary for the consecration of our nation.